Created by Angelique Edmonds for the School for Creating Change, the world premiere experimental urban walking trail allowed kids to explore and discover how city spaces are created and for whom. Running over nine days, from May 22-30, the Come Out Children’s Festival was created to engage, stimulate, challenge, educate and entertain young minds. 10 minute studio visits by groups of school children were hosted throughout the festival by Alex Hall, Anoop Menon, Emily Anderson, Mel Hunter, Milos Milutinovic, Sarah Howden, Simon Tothill, Stuart Uren and Thomas Masullo. 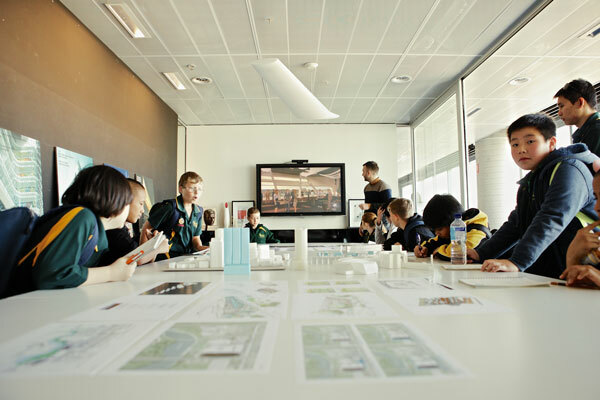 They explained what an architect does as well as the design behind local Woods Bagot projects such asSAHMRI, Adelaide Convention Centre, Vue on King William and City Central Tower 1, Tower 2 and Tower 8. The Come Out Children’s Festival is produced and presented by Adelaide Festival Centre and is supported by the Government of South Australia through Arts SA and the Department for Education and Child Development.